A number of filmmakers and journalists have given some attention to the topic of high school sports in small-town Montana, most notably the makers of the basketball documentary, Class C: The Only Game in Town. The Slaughter Rule uses as its backdrop the six-man high-school football teams in the Golden Triangle country north of Great Falls. The scenes are evocative and lonely, particularly those of a wintry game filmed up in Heart Butte. 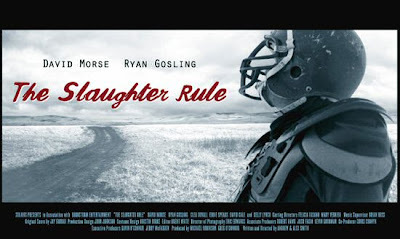 The film is a fictional drama, though, and is less a study of football than it is of isolation and uncertainty, as its characters struggle to find their places in life. It's one of the most depressing and troubling films you'll ever see, but there's great cinematography and a fair amount of Montana insight. Another movie that's worthwhile, but definitely not for everyone. If you're looking for a feel-good Montana movie, there's no doubt that the film to rent is Big Eden. Completed in 2000, it's the story of a gay New Yorker who goes back home to Montana to take care of his ailing grandfather. There, he has the chance to finally become part of a real community, and perhaps to find love, as well. Perhaps more fable than drama, there's no doubt that Big Eden is unrealistically rosy in its portrayal of small-town acceptance, but there's also no doubt that it's an engaging and heartwarming story. And the settings are among Montana's most gorgeous -- much of the movie was shot in Glacier Park, and if you've been to Swan Lake you'll recognize the general store in the film. 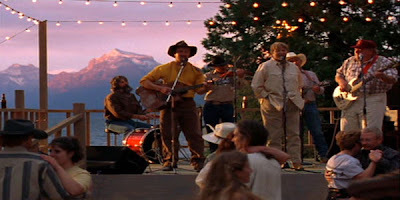 Here's a screencap from Big Eden's 4th of July celebration, which was filmed in Apgar. You can't help but recognize those mountains! 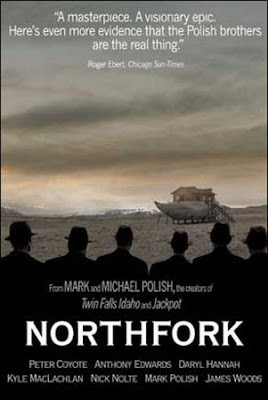 My first movie recommendation for the week is Northfork, a 2003 art-house film that was shot in the country around Great Falls and up on the Hi-Line. The film is set in 1950s Montana, where the dying little town of Northfork is about to be flooded by a hydroelectric project. Everything is lonely and elegiac, with handsome photography reminiscent of The Last Picture Show. As for the storyline, it's definitely both surreal and odd ... odd enough that it likely won't appeal to everyone. But I enjoyed it ... and even those who don't will still appreciate the visuals, which convey a real sense of place. And the film has a relatively star-studded cast by Montana standards, including Nick Nolte, James Woods, and Daryl Hannah. As you know by now, I'm pretty intrigued by the subject of Montana movies ... either films about the state, or ones that were shot here. There's quite a list in both of those categories, and I'm a long ways from having seen most of them. I was thinking about this partly because a friend recently pointed me to a grassroots poll being conducted by fans of the Montana Committee for the Humanities -- a Montana Movie Tournament. There are 32 films on the voting list, a fairly motley cross-section of movies. Some were actually filmed in the state, others only set here. The list includes documentaries, small independent films, and the usual big-budget classics that are sure to dominate the vote. Overall, I thought it was a little disappointing. Nonetheless, they've constricted the beginning to a Montana movie list -- it's got some of my favorites, some that I've really been meaning to see (or see again), and even a couple of recent documentaries that I can't wait to watch. (Sweetgrass and Prodigal Sons are both in the latter category.) So the list is worth a look. 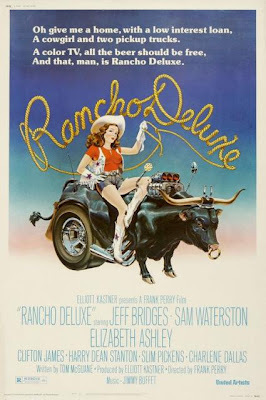 I think I'll devote the next few posts to a few of the more offbeat Montana movies on the list ... and then maybe I'll construct a list of my own someday. Grace Stone Coates was a teacher and the wife of a Martinsdale rancher ... and one of Montana's best-known authors from the first half of the twentieth century. As with so many other Montana literary figures, she was long affiliated with the creative writing program at the University of Montana; she helped edit its literary journal, and wrote well-regarded poetry and fiction. Here's an excerpt from a 1932 poem of hers called, "The Old Freighter Comes Back in a Ford." It expresses some sentiments that many Montanans would identify with today, but that also must have had some relevance almost eighty years ago. Montana isn't the West, any more!" I smile -- at something I've heard before. It isn't the West like it used to be!" Stings in my eyes and stabs my throat. A man must carry it in his breast. While it's always fun to see the more standard tourist attractions, generally I'm far happier exploring offbeat and under-explored destinations ... places that relatively few people get a chance to see. (Or would want to, for that matter.) Here's a photo I took back in 1992 of one such place -- right at the edge of Glacier National Park. Sherburne Dam and reservoir were constructed in the late 1910s to store irrigation water for the Milk River Project, which helped irrigate large areas of the central Hi-line country. Nearly the entire reservoir is inside Glacier Park ... it's the one you see driving up the road from Babb to Many Glacier. The dam itself is a big earthen structure, and there's a round concrete tower sitting in the reservoir by it. The tower is part of the dam's spillway ... an unusual design known as a "glory hole." 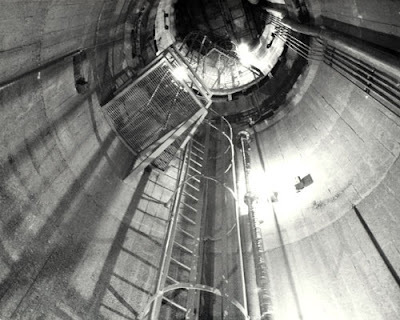 I got to climb down the ladder to the bottom of the glory hole -- well below the waterline -- and this is a shot I took looking back up. Here's the intriguing story of a Montanan you've probably never heard of ... Urban F. Diteman, the "cowboy pilot." Born in Oregon, Diteman moved to Billings in the 1920s with his wife and two young sons, and took up cattle ranching. He soon developed a fascination with flying, and earned a pilot's license in August 1929. 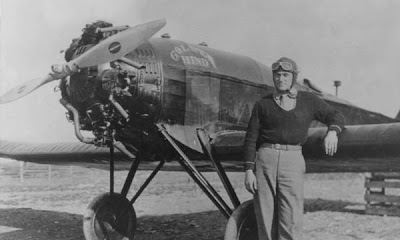 Armed with only 70 hours of flying experience, he traveled to Kansas City, purchased a used, open-cockpit monoplane, and flew east on his great adventure. "I am bound for London. You will find a package and two letters in my hotel room. Forward same as addressed. Be sure to wrap the bundle in heavy paper. Hold the tools a few days for cable instructions otherwise send to same address. I have 165 United States standard gallons of gasoline, at a conservative estimate enough for 25 hours. "Many thanks, you Newfoundlanders, for your kindness, and apologies for my impromptu lies about Drake. He did not bring me here, nor to London, albeit I am his descendant. You will hear from me." That morning, observers along the Newfoundland coast watched Diteman's little plane flying eastward into the mist. Had he succeeded, he would have been the second person to fly across the Atlantic alone ... but he was never seen again. Montana has a fascinating -- though slightly uneven -- assortment of state parks. Many of them are recreational sites attached to reservoirs and such, but there are also a number of intriguing historical parks, and a smaller number of really engaging natural wonders. Heading the latter category, of course, is Lewis & Clark Caverns, which was Montana's first state park ... but my favorite is a remote and little-known site way on the opposite end of the state. This is a shot of Medicine Rocks State Park, just off state highway 7 between Baker and Ekalaka. 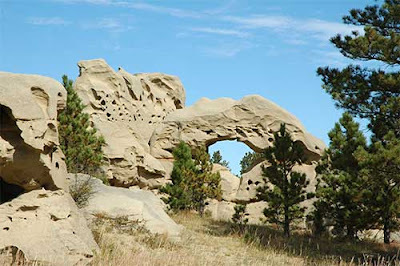 It's a lovely little oasis in a sea of prairie -- a maze of weirdly-carved rock formations that's fascinating to explore. I spent a September night in the campground there a few years ago, the only person for miles, and it was beautiful and serene and utterly glorious. Browsing old photos about Montana, you're sure to find lots of images that are poignant and lovely ... along with a few that will just make you smile. Here's one that definitely falls into the latter category. I discovered this one in a 1933 tourist booklet called "Western Montana: A Land that Enchants the Traveler, Enriches the Settler and Inspires Everyone." The thing was apparently issued by the Chamber of Commerce in Butte, though it includes information about the entire western half of the state. 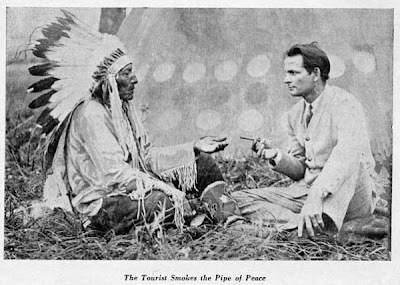 I honestly doubt there were very many recorded instances of tourists smoking authentic peace pipes in Butte ... but I guess that sort of smoke sounded more appealing than the toxic industrial soot that characterized the city in its early years. One of my favorite Montana books is a big paperback volume called Not in Precious Metals Alone: A Manuscript History of Montana. 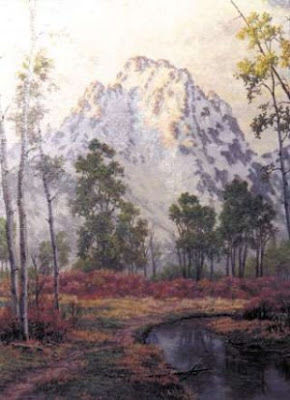 Long out of print, the book is a collection of primary source materials about the state's past, transcribed and collected by the staff of the Montana Historical Society. There aren't too many monumental things in there ... but there's lots of fascinating reading, mostly on an insightful, personal scale. I want to drop you a line to informd you that the [Deer Lodge] sporting house is running Wide open, Music, & selling drinks. May Carroll charge us girls $15.00 per week, & want us to stay with greeks for $2.00 & A White man for $3.00. She treats us girls like dogs. She is in Butte today gathering more girls . . .
Its a shame to closed the rest of the sporting Houses & leave Deer Lodge run. Its put me out $1000, for I was working [in Butte.] Deer Lodge house [has] 4 to 7 girls working all the time. All we girls want is justice . . . I am writing to you hoping you will closed Deer Lodge or open the rest of the good towns. 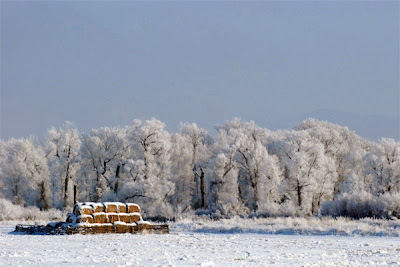 Today's photo is another wintry shot from late 2007 ... this one is a little outside of Three Forks. 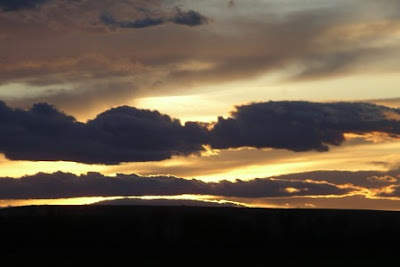 I shot this from Interstate 90, probably without even getting out of the car so I could stay warm. 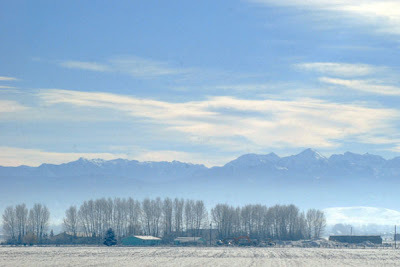 It seems like it's been a little while since I've posted some recent photographs, so here are a couple of wintertime shots from the Gallatin Valley. I took this shot in November 2007, a little bit east of the town of Manhattan. And speaking of rodeo, here's a fairly cool old photograph. 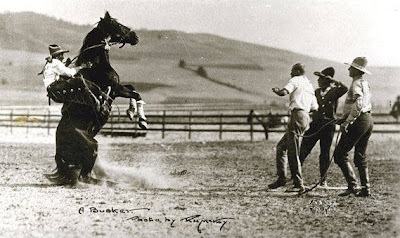 Titled "A Bucker," this shot was taken by Missoula photographer Rollin McKay sometime during the early twentieth century. McKay's photographs are now preserved at the University of Montana's archives. You gotta love the vintage cowboy costumes in this shot. One more piece of railroad-related art before we move on to other things ... and this one is perhaps my favorite. The construction of the Milwaukee Road across Montana was one of the state's greatest engineering efforts, and it had an even more exceptional sequel -- soon after it opened, the railroad decided to electrify the most mountainous parts of its line. Hydroelectric power from Great Falls was transmitted to the railway, and then transferred to specially-built locomotives via a system of catenary wires strung above the tracks. 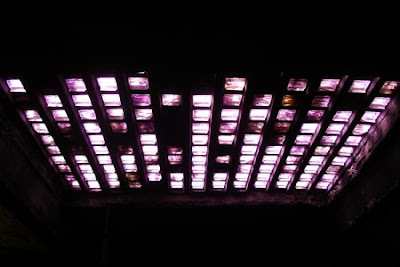 It was thoroughly impressive technology for its day, almost unprecedented in its setting and scale. For decades thereafter, the Milwaukee was the longest electrified railroad in America. Justifiably, the Milwaukee's electrification project drew significant attention, both in the engineering community and beyond. The railroad heavily advertised the new technology and its benefits -- as did General Electric, which designed and supplied much of the equipment. Many of the promotional materials featured dramatic, almost futuristic art ... like this gorgeous example, which graced the cover of a small book about the electrification that the railroad published in 1917. Though the Union Pacific is one of the West's largest railroads, it barely enters Montana ... just a line from Idaho up to Silver Bow, and a now-abandoned branch into West Yellowstone. 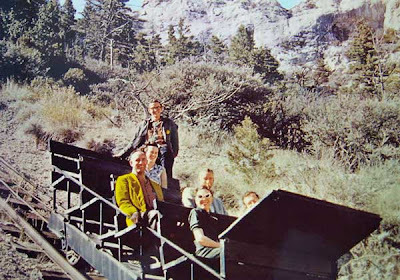 The latter line was only open in the summertime, and was built specifically to bring tourists to Yellowstone Park. It was by far the most popular rail route to Yellowstone. For close to 40 years, the UP promoted its Yellowstone service with a series of clever, annual drawings featuring cartoon-like bear cubs, mostly drawn by an Omaha artist named Walter Oehlre. The theme was continued in other promotional materials, as well ... things like luggage stickers and children's' dining-car menus. It was definitely one of the most appealing of railroad advertising programs. I'm trying to locate a digitized copy of one of the Oehrle ads, but they're surprisingly hard to find. Here's an ad that predates that era, but shows the beginnings of the theme. 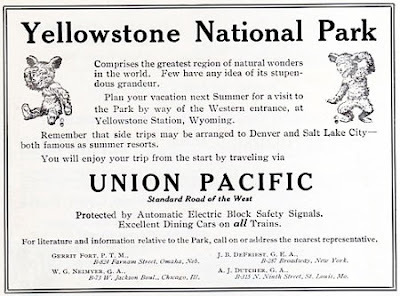 It's from 1912, and reveals that, at least for a little while, someone in the UP's advertising department thought that West Yellowstone was in Wyoming! 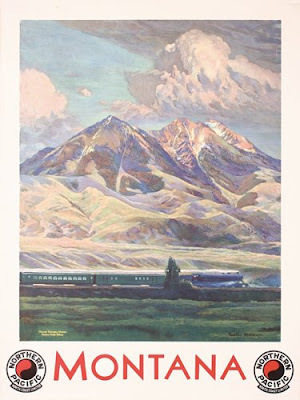 Winold Reiss was arguably the best (and the best-known) artist historically associated with Montana railroading. Reiss first visited Montana in 1920 and immediately fell in love with the place, while simultaneously becoming fascinated with the Blackfeet Nation and its culture. Before long, that infatuation translated into a business arrangement with the Great Northern, which frequently used Blackfeet themes in its advertising. 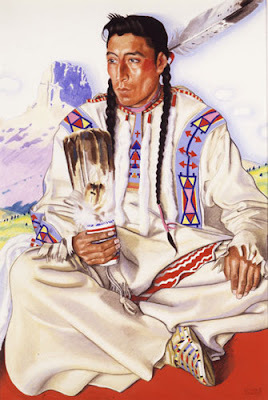 For a quarter century, Reiss painted handsome, modernistic portraits of the Blackfeet for the GN, which the railroad used on its calendars, dining-car menus, and other promotional materials. Today, the Reiss material is rare and highly collectable ... and just as appealing as ever. Reiss spent a fair amount of time on the Blackfeet reservation and in Glacier, especially during his earlier years ... and during the mid-1930s he actually operated an art school in the former St. Mary Chalet buildings, hiring local Blackfeet to serve as models for his students. Nationally, his best-known commission was for an amazing series of murals that hung in Cincinnati's railway station. Today, a few of those murals are at the Cincinnati airport, looking woefully out of place. Here's one of the last paintings Reiss did for the Great Northern ... a portrait of Floyd Middle Rider, completed in 1948. That's Chief Mountain in the background. It's a gorgeous and evocative image, without a doubt. (Those are the Absarokas in the background.) I have to say, though ... the train looks more like one that should be headed to Hogwarts, rather than Livingston. 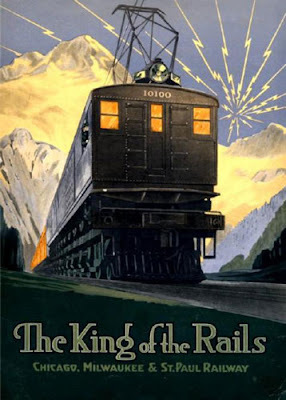 The Great Northern Railway issued some of the most beautiful promotional material ever created for Montana ... not surprising, really, since the railroad's route alongside Glacier Park brought it close to the most beautiful scenery in the state. Over the course of fifty years, Glacier figured very strongly in much of the Great Northern's advertising material. That was especially true in the 1910s and 1920s, when the GN was the primary means of long-distance travel to Glacier, and the railroad's network of hotels and chalets in the park was at its peak. The image below is the cover of a small paperback issued by Great Northern in 1927. 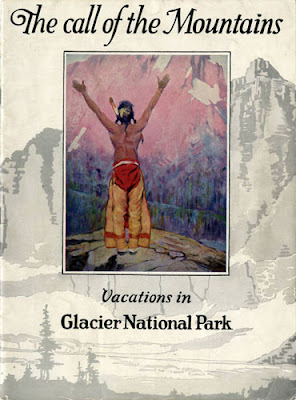 As with many of the GN's Glacier-related publications, the artwork is a visual blend of two recurring themes: spectacular scenery and romantic Native American culture. "The Call of the Mountains is a real call -- Go out and ride the mountain trails -- look across green valleys to wild peaks where mountain goats stand impassive on the edge of space -- then the mountains will get you." 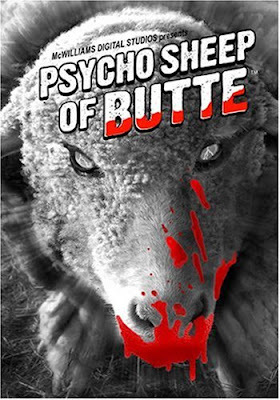 At least among historians, this is probably one of the best-known pieces of commercial art ever created about Montana. 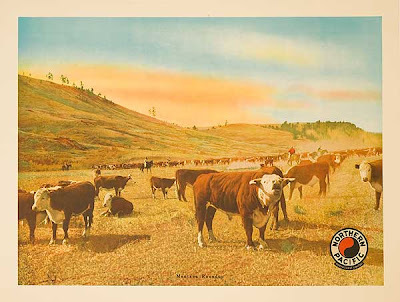 This is the cover of a promotional brochure printed by the MIlwaukee Road back in 1917, part of an advertising campaign designed to lure homesteaders to the state. Plowing up gold coins from the Montana prairies .. definitely an allegory that would be hard to resist. 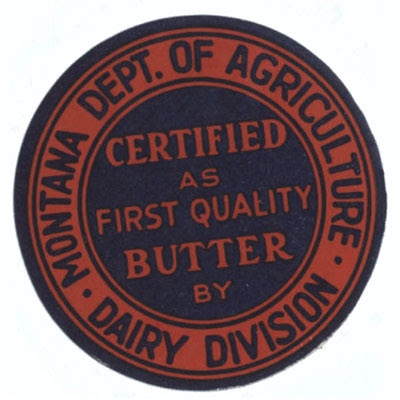 The Milwaukee, of course, was just one of many entities that promoted Montana homesteading back in the 1910s. Unfortunately, this brochure was released during the last great year of the homestead boom. Before long, years of drought and lower commodity prices would force most of the homesteaders to move on, leaving behind a shattered eastern Montana economy. But still, it's a great image.